CBI - China: Day 14 of 154 of the Japanese Invasion of Manchuria. Spain: Day 77 of 985 of the Spanish Civil War. Francisco Franco becomes dictator of Spain and is declared Head of State, but the war will continue for years before his Nationalist forces finally defeat the Republican Army. Spain: Day 442 of 985 of the Spanish Civil War. CBI - China: Day 87 of 2,987 of the 2nd Sino-Japanese War. Day 50 of 106 of the 2nd Battle of Shanghai. Day 31 of 70 of the Battle of Taiyuan. Germany: Following the Munich Agreement signed yesterday, German forces occupy the Sudetenland of Czechoslovakia, absorbing it into the Third Reich. The Czech Government, not invited or consulted in the matter, calls it the Munich Betrayal. Much of their border defenses, banks and heavy industry has just been handed over to Hitler. Their military alliance with France and Britain has proven to be useless. Spain: Day 807 of 985 of the Spanish Civil War. CBI - China: Day 452 of 2,987 of the 2nd Sino-Japanese War. Day 113 of 139 of the Battle of Wuhan. Poland: Day 31 of 36 of Germany's Invasion of Poland. German troops enter the devastated city of Warsaw. The Polish garrison on the Hel Peninsula surrenders to the Germans after repeated attacks. Poland: Day 15 of 20 of the USSR's Invasion of Poland. CBI - China: Day 817 of 2,987 of the 2nd Sino-Japanese War. Day 19 of 26 of the 1st Battle of Changsha. Results in a Chinese victory. ETO - UK: Day 26 of 258 of the Blitz. ETO - UK: Day 84 of 114 of the Battle of Britain. East Africa: Day 114 of 537 of Italy's East African campaign in the lands south of Egypt. PTO - Australia: Petrol rationing is introduced. CBI - China: Day 1,183 of 2,987 of the 2nd Sino-Japanese War. Day 322 of 381 of the Battle of South Guangxi. CBI - China: Japanese troops occupy a British concessionary island off Wei-hai-wei. CBI - Thailand: Day 1 of 221 of the Franco-Thai War (Vichy France vs Thailand). Russia: Soviet-British-US conference in Moscow concludes, committing the UK and US to supply Russia. Russian Front - Finland: Day 95 of 142 of Operation SILVER FOX, a joint German-Finnish campaign to capture the Russian port of Murmansk in the Arctic. Russian Front - Finland: Day 93 of 140 of Operation ARCTIC FOX, a joint German-Finnish campaign against Soviet Northern Front defenses at Salla, Finland. Russian Front - Finland: Day 102 of 164 of the Battle of Hanko. The Soviets will be forced off their leased naval base. Russian Front - Finland: Day 28 of 28 of Finland's reconquest of East Karelia in southern Finland. The Soviets have withdrawn from the Karelian Isthmus back to Leningrad. Russian Front: Day 102 of 167 of Germany's Operation BARBAROSSA. Russian Front - North: Day 24 of 872 of the Siege of Leningrad. Russian Front - Center: Panzer Group 2 opens its offensive against Moscow two days ahead of the rest of Army Group Centre and advances toward Orel. Russian Front - South: Day 55 of 70 of the Siege of Odessa, Ukraine. SS Einsatzgruppen in the Ukraine massacre between 50,000 and 96,000 Ukrainians at Babi Yar, about 30 miles outside of Kiev. Russian Front - South: Day 6 of 12 of the Battle of the Sea of Azov (north of Black Sea). An advance into the Crimea by German Army Group South is halted. MTO - Libya: Day 175 of 256 of the Siege of Tobruk. The German 5th Light Division is re-designated as 21st Panzer Division. East Africa: Day 479 of 537 of Italy's East African campaign in the lands south of Egypt. CBI - China: Day 1,548 of 2,987 of the 2nd Sino-Japanese War. Day 26 of 33 of the 2nd Battle of Changsha. Russian Front - North: Day 389 of 872 of the Siege of Leningrad. Russian Front - North: Day 150 of 658 of the Siege of the Kholm Pocket, USSR lays siege to the Kholm Pocket but the Germans hold out for a about a year and a half. Russian Front - Center: Day 64 of 64 of the 1st Battle of Rzhev-Sychevka, Russia. Ends in a stalemate as Soviet troops are needed elsewhere. But enough troops were kept behind to keep the opposing German troops from going to Stalingrad. Russian Front - South: Day 96 of 150 of Germany's CASE BLUE, the failed offensive to take the Caucasus oil fields. Russian Front - South: Day 40 of 165 of the Battle of Stalingrad, bloodiest battle in human history. MTO - Greece: US B-24s bomb shipping in Pylos Bay, claiming 2 direct hits. East Africa: Day 150 of 186 of the Battle of Madagascar. CBI - China: Day 1,913 of 2,987 of the 2nd Sino-Japanese War. PTO - Alaska: Day 117 of 435 of the Battle of Kiska, Aleutian Islands. The US and Canada will defeat the Japanese invaders. PTO - Malaya: Day 225 of 357 of the Battle of Timor Island, a long guerrilla war ending in Japanese victory. PTO - New Guinea: Day 73 of 119 of the Battle of the Kokoda Track. The Australians continue pushing back the Japanese troops. PTO - Solomon Islands: Day 56 of 187 of the Battle of Guadalcanal. Russian Front - North: Day 754 of 872 of the Siege of Leningrad. Russian Front - North: Day 515 of 658 of the Siege of the Kholm Pocket. USSR lays siege to the Kholm Pocket but the Germans hold out for a about a year and a half. Russian Front - North: Day 6 of 15 of the USSR Kremenchug Offensive into Estonia. Russian Front - Center: Day 56 of 57 of the 2nd Battle of Smolensk, Russia. Axis troops begin pulling out of Dukhovshchina. Russian Front - Center: Day 46 of 48 of the Battle of Bryansk, Russia. The Germans continue to retreat. Russian Front - South: Day 39 of 122 of the Battle of the Lower Dnieper River, USSR. MTO - Egypt: US 9th Air Force begins moving from Egypt to England. MTO - Italy: US 12th Air Force B-26s hit targets at Capua, Grazzanise, Arce, and Mignano. B-17s and B-24s bomb targets in Austria. MTO - Italy: US 12th Air Force fighters and light bombers run tactical support missions at Benevento, Capua, Isernia and Avezzano as Allied forces take Naples and Foggia. CBI - China: Day 2,278 of 2,987 of the 2nd Sino-Japanese War. PTO - New Guinea: Day 13 of 219 of the Battle of Shaggy Ridge. Will become an Allied victory. PTO - New Guinea: Day 10 of 162 of the Battle of the Huon Peninsula. Will result in an Allied victory. PTO - Solomon Islands: Day 48 of 56 of the Battle of Vella Lavella. ETO - Germany: Day 13 of 145 of the Battle of Hürtgen Forest. The "meat grinder" kicks into high gear. It will become the longest battle on German ground during World War II and the longest single battle the US Army has ever fought. The Germans are fiercely defending the area because it serves as a staging area for the Ardennes Offensive (what will become the Battle of the Bulge) that is still in preparation. The Battle of Hürtgen Forest is the name given to the series of fierce battles fought between US and German forces during WWII in the Hürtgen Forest from 19 Sep 44 through 10 Feb 45. Some of the most brutally intense infantry combat in World War II occurred within Germany's Hürtgen Forest (just east of the Belgian-German border), costing the US 1st Army at least 33,000 killed and incapacitated, including both combat and noncombat losses. German casualties totaled 28,000. The Germans fiercely defended the area for two reasons: it served as a staging area for the Ardennes Offensive (what became the Battle of the Bulge) that was already in preparation, and the mountains commanded access to the Schwammenauel Dam at the head of the Rur Lake which, if opened, would flood low-lying areas downstream and deny any crossing of the river. The Allies only recognized this after several heavy setbacks, and the Germans were able to hold the region until they launched their last-ditch offensive on the Western Front into the Ardennes. Historical discussion revolves around whether the American battle plan made any strategic or tactical sense. 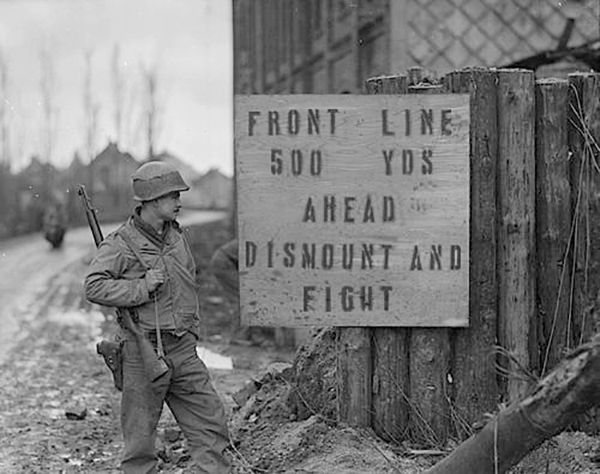 One analysis is that US strategy underestimated the strength and determination remaining in the psyche of the German soldier, believing his fighting spirit to have totally collapsed under the stress of the Normandy breakout and the reduction of the Falaise Pocket. American commanders in particular misunderstood the impassability of the dense Hürtgen Forest and its effects of reducing artillery accuracy and making air support impracticable. In addition, American forces were concentrated in the village of Schmidt and neither tried to conquer the strategic Rur Dams nor recognized the importance of Hill 400 until an advanced stage of the battle. ETO - France: Day 62 of 284 of the Battle of Brittany. ETO - Belgium: Day 30 of 62 of the liberation of Belgium. ETO - France: Day 17 of 236 of the Siege of Dunkirk. The German garrison at Calais surrenders to Canadian troops, thus the cross-channel guns that had been pounding Dover for the last three years are finally silenced. Russian Front - Finland: Day 17 of 223 of the Lapland War. Finland and Russia have joined forces to kick the Germans out of Finland's most northern province. The Finns make an assault landing against German held Tornio, in Gulf of Bothnia. Russian Front - North: Day 18 of 41 of the Battle of Riga, Latvia. Russian Front - Center: Day 18 of 72 of the Battle into East Prussia and northern Poland. Russian Front - South: Day 18 of 72 of the Battle of Belgrade, Yugoslavia. The Soviets cross the Danube into Yugoslavia. Russian Front - South: A secret Hungarian delegation arrives in Moscow to sign an armistice with the Russians. MTO - Italy: Monte Battaglia on the Gothic Line is captured by the US 5th Army after a 4-day battle. MTO - Italy: US 12th Air Force B-25s and B-26s attack targets in the Po Valley. A-20s and fighters hit targets in battle areas between Florence and Bologna. CBI - Burma: Day 184 of 302 of the Chinese Salween Offensive in Burma. CBI - China: Day 2,644 of 2,987 of the 2nd Sino-Japanese War. Day 168 of 259 of Japan's Operation ICHI-GO. PTO - New Guinea: Day 292 of 597 of the Battle of New Britain. PTO - New Guinea: Day 163 of 481 of the Battle of Western New Guinea. PTO - Palau Islands: Day 17 of 74 of the Battle of Peleliu (Operation STALEMATE II). PTO - Palau Islands: Day 15 of 36 of the Battle of Angaur. Germany: At the Nuremberg trials, Former Deputy Führer Rudolf Hess is found guilty on two counts: crimes against peace and conspiracy with other German leaders to commit crimes. He is sentenced to life imprisonment, which he will spend at Spandau Prison in western Berlin until his death in 1987 at the age of 93.